Everyone has those moments when you’re studying or doing homework at 1 a.m and BAM! All the sudden you are starving and all that will satisfy the growling monster called your stomach is a slice of dope warm ‘za. Too late for Pizza Fest. Too early for good grub. I know it, I’ve experienced it, I FEEL YOU! Therefore, I decided to write you my definitive list of the best pizza in B-Town. Just a heads up, people have been challenging me on the “definitiveness,” and I am ready to fight back… I spent a semester in Rome, and my mom is actually the Queen of Pizza, so I AM AN EXPERT ON GOOD PIZZA. Here’s the guide I know all of you will use when venturing downtown (or ordering in) for your next slice of gooey goodness. The following are are ranked from 5 (“meh”) to 1 (“comparable to getting an A on that exam you SWORE you failed” feelings). Ok, I get it, they have great prices for a full pizza, but lets be real… that’s for a good reason. I can never eat Domino’s pizza and feel good after eating it. It’s a fact. I’m pretty sure no one really can. Just so everyone knows, Italians laugh at the thought of considering Domino’s actual pizza. But, you know…they deliver! They’re also open the latest on the weekend out of any of the five places I picked, so like ok, they get points for that. Honestly, I have never been a fan of excessively greasy pizza, and I feel like Big Daddy’s is the KING of grease. Could just be me. Although, if you are looking for a place with little to no lines, Big Daddy’s is the place for you. Plus – again… ya can’t beat delivery. Big Daddy’s earns it’s spot on the list for being open the latest any day of the week. Especially important during finals week and it’s odd eating schedules. Plus, points always to the pizza place that can bring the ‘za to me – Delivery is key, especially when I am KO’d from hours of studying and living in the lib. Unpopular opinion but, I think that Juniors is actually belongs in the number 2 spot. Shocking, I know. Why? because it is very similar to New York pizza – which is the only pizza I will admit to being good other than my mother’s pizza outside of Italy. Also, shorter waits in line (WORTH IT!!!). Junior’s is open til’ 2AM Friday, Saturday, and Sunday ensuring once you’ve closed them books you can decompress with some solid slices. UVM Students get 15% off with UVM student ID (dine in only) AND they accept Cat$ratch. Plus online ordering and (once again) delivery, FTW (see above). On the plus side, running into your friends is completely possible here as that Main Street and South Winooski intersection is bustling with folks. The slices come out pretty quickly, ensuring you a great in ‘n’ out experience. Three Needs is (in my not so humble opinion) the best late night or grab n go pizza downtown. Not only is their dough incomparable, there is NOTHING like the feeling of a Duff hour slice. $1 slices after 5pm?! SIGN ME UP. PIZZA FOR EVERYONE, ON ME! I love how they make a huge deal out of it with the flashing light, very relatable. Pizza is really that important. I also adore how intriguing the pizza toppings are. The Duff? I’m not even sure what’s on it but it is delicious. Kale pesto and beets?! Who the HECK could put that on a pizza and succeed? NOT ME, NOT OTHER PIZZA PLACES, BUT ONLY THREE NEEDS. Plus…calzones! Ben Wyatt would be stoked. All the deliciousness more than makes up for a lack of a dine-in experience – you can only snag a slice at the sidewalk window or by delivery; but it’s totally worth it. 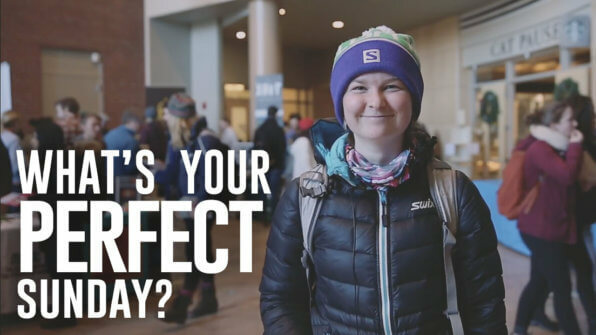 Video Blog: What's Your Perfect Sunday?